Whether you need tree maintenance services or you want outdoor improvement with our landscape services, the skilled arborists of Ballard Tree Service Inc. in Seattle, Washington have all the tools and knowledge needed to get the job done right. We have been awarded the Angie's List Super Service Award since 2010. Check out the feedback of some of our satisfied clients. You Guys Are Fantastic by Mary R.
"You guys are fantastic! My husband and I are very happy with the work you did for us, and your crew was polite, friendly, efficient, and very considerate. Thanks so much!" My Property Is Safe by Mike M.
"I can't tell you how glad I am that I hired you this fall to cut down trees and wind sail the rest. As trees fall all over Browns Point, my property is safe! See you at Safeco Field." "Just wanted to let you know what great work your team did. They cleared, chipped, and hauled away a huge pile of yard waste and also then trimmed a tree that Seattle City Light were threatening to lop for us! Everything was beautifully cleaned up and the tree looks wonderful (and is well clear of the power lines)." I Will Definitely Use You Next Year! "Thank you to Martin and Paul for the great job they did pruning my old big leaf maple trees. They were very efficient and left the work area clean and raked. This is the second year Ballard Tree has done the work for me and I will definitely use you next year." 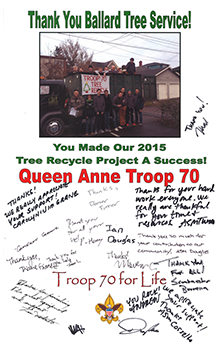 "Thank you everyone at Ballard Tree Service! I was immediately impressed with Andy (our arborist for the day) who was exceptionally polite and articulate. It's the little details that make all the difference to homeowners; your crew took the time to finish the job right. We will be sure to recommend you to our friends and family!" "I just wanted to tell you that was a pleasure meeting you. I also want to thank you again for the terrific job that Matt and Roland did on my tree removal. They were great guys to work with in addition to being fast and efficient. I can now sleep at night when the wind blows. I'm already referring you to everyone!" "Thank you for years of great service. I'm pleased as punch with this most recent job. You can count on me for referrals." "Thank you so much for your kind attention and excellent, efficient work. We will definitely recommend you to our friends."